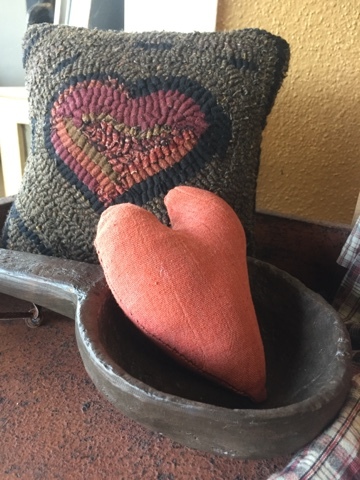 GATHERINGS FOR THE HOME: Hearts!! Welcome to my blog where we can share ideas about how to use ordinary items in unique ways to make our homes special. I am quite certain this gal has been a slacker. Last post was December 2016 and here it is already February 2017 ? How can that be? Where has the time gone? I know I started the new year not with a resolution but with determination that I would clean out , organize at home and the shop. That I have been doing and I guess that has been my main focus. It feels good to toss out or donate what is not needed in our everyday life. That being said here it is February without nary a post. or handcrafted. My husband for years has given me heart necklaces or earrings that I so enjoy wearing throughout the year. Also they can be found in my home in various spots. With Valentines a few days away I also make sure there are hearts in my store. What says love more than a heart? Well maybe a sweet kiss or a hug!